Massage Atelier of Beata Juengst in the center of Bydgoszcz was established with a view to pursuing passion which is to give comfort and relaxation, and maintenance of health. 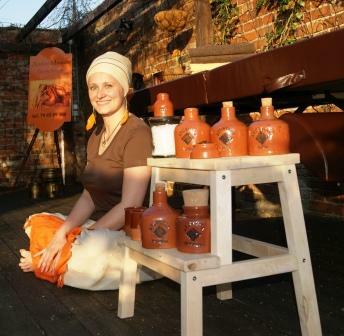 Explore the story of the founding of one of the best massage ateliers in Bydgoszcz. I offer a wide range of massage and wellness treatments, including Classic massage, relaxation, Lomi Lomi, chocolate massages, hot stones, body scrubs and more. Feel free to read the offer massages and treatments in my atelier. 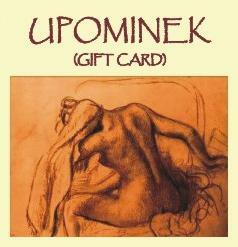 Feel free to purchase a gift card to any massage or a voucher of five and the 10 treatments. This is the perfect gift for any occasion, such as Women's Day, Boy's Day, namedays, birthdays and many others. Feel free to familiarize yourself with the details. Massage Atelier of Beata Juengst is a stylish massage salon and wellness services in the city of Bydgoszcz in the Old Square. Wood, the walls of historic buildings, flowers, subtle scents, warm colors and a beautiful courtyard create a unique atmosphere of the Atelier. The highest standard and excellent state of mind of Guests are a priority of the Atelier. The temperature of the room where the procedures are performed and the oil temperature is maintained at a level that ensures comfort. The Atelier you will get a towel and shower gel. Both before and after the massage, so you can use the shower. Massages and treatments are performed with using only natural oils - coconut, almond, sesame, herbal, and specialty mixed powders suitable for modeling figure and skin elasticity. 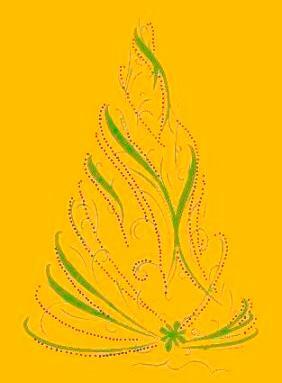 All Clients, Co-workers and Friends of Massage Atelier of Beata Juengst, I wish full of love, health, wellness and calm Christmas. I send You all my positive emotions and smile to attend you in New 2013. Save optimism and energy in every action! Bydgoska Lokalna Organizacja Turystyczna BYLOT has been functioned in Bydgoszcz since December 2006 and it's focused on tourism development in Bydgoszczy and neighborhood. BYLOT's goals are oscillating around commitment differentiated public to creating tourism, with idea: "Bydgoszcz is connecting us". 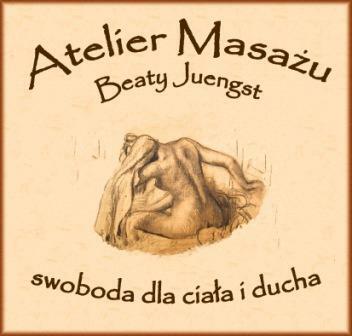 Massage Atelier of Beata Juengst is not uniterested in ivents in Bydgoszczy - it wants to assist in healthy lifestyle development, and also wants to cough small donation of attractiveness up to tourist and recreational offer of the City. 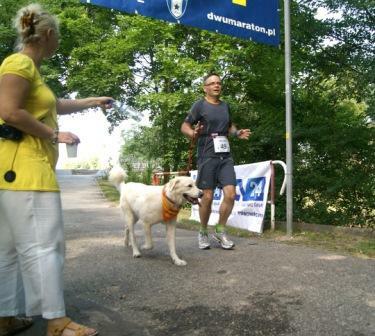 The First Running with his paw - 04.08.2012 r.
Feel free to visit gallery and my opinion about this Marathon in Bydgoszcz. Information about Apple-Cake was published in my blog. On 7 May 2012, in the courtyard of the Massage Atelier, there was a National Vegetarian Day, organized together with the Alternative Salon. To familiarize yourself with the details I invite you to myblog. Among the participants there was a draw for three treatments performed in the Alternative Salon and 3 massage treatments to be done at Atelier. 3 lucky ladies are invited for the massage! On 05-06 May 2012, at High School No. 28 in Fordon, there was held XI International Karate Championships "Open Central Europe", organized by the Sports Club BUSHI Karate-DO in Bydgoszcz. Massage Atelier sponsored some prizes in these Championships. 3 gift cards for the intuitive massage went into hands of undefeated three girls from the club BUSHI-DO. The ladies are invited for the massage! On 27-28 April 2012, in Rafa near Ostromecko, there was a photo session of Massage Atelier with the model Agnieszka Najzer (www.oneloveart.pl). Photos were taken by: Sylwia Migota (www.migota.pl) and Aneta Witerska. Photos from this session will soon appear on the website, my blog and on Facebook. I would like to thank Agata Girzejewska for sharing the beautiful and magical place to take photos, and Agnieszka, Sylwia and Aneta for a wonderful session, the positive energy of this wonderful event and unforgettable emotions. 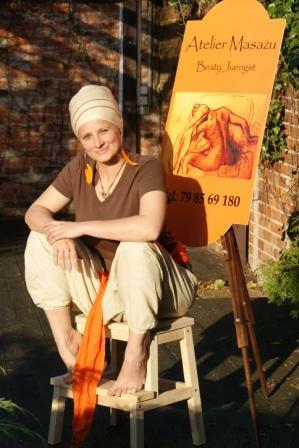 I would also like to thank to Agnieszka Żakowska of Alternative Salon for tuition and creation of unique turbans. Massage Atelier of Beata Juengst is one of the sponsors of the awards in the "First Running with his paw" Marathon in Bydgoszcz. 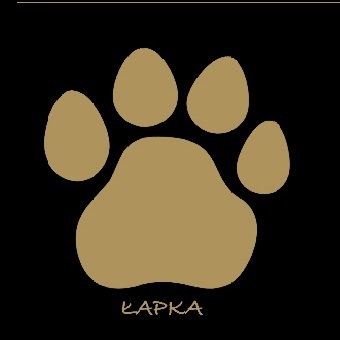 If running with your dog is not strange to you, or you would like to try it for the first time, join the marathon. 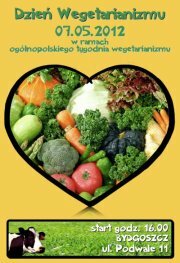 Join the action of Bydgoszcz Club of Friends of Animals - ANIMALS. To care about the animals future you need to run just a part of the planned route, and some you can walk. The only thing you have to do is to apply as a participant in the marathon, you will join 4 August 2012 the group of positive people and you will go along with your dog a designated route. In addition ... for the first man and the first woman at the finish the Massage Atelier sponsored the award in the form of massage. Feel free to visit my blog where I publish articles on massage and comment them, and many other of information and pictures. 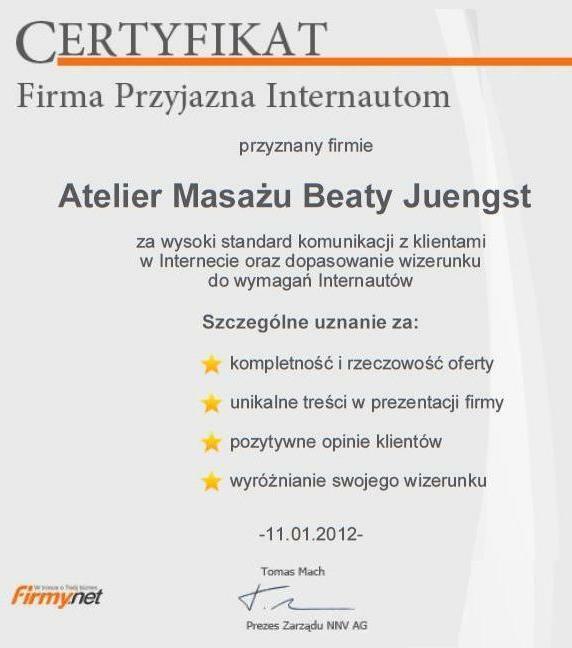 Massage Atelier of Beata Juengst has obtained The Certificate of Internet Users Friendly Company. 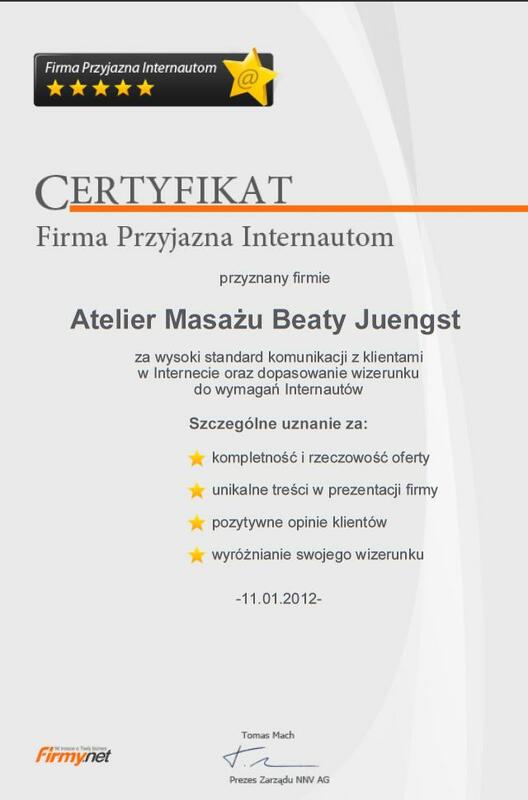 - Positive references of companies cooperating with the Massage Atelier of Beata Juengst. I am pleased that the actions of effective communication with clients and subcontractors, were appreciated by an impartial jury. Photos of Massage Atelier of Beata Juengst  Atmosphere of the Massage Room and the massage.